Pleated Sediment Cartridge 20″ x 4.5″ 20 Micron Pleated Sediment Cartridge 20″ x 4.5″ 5 Micron Suit: 20″ Big Blue. These sediment cartridges are constructed from polypropylene, spun & melted simultaneously. This means, no centre core to restrict performance. Compatible with most liquids & highly effective for sediment, rust, sand, silt, & algae removal. These have no chemical residuals. High performance, carry a heavy load before replacement. We use these sediment filters over other types due to the performance, high flow rate, high load capacity, and their inability to grow bacterial slime. 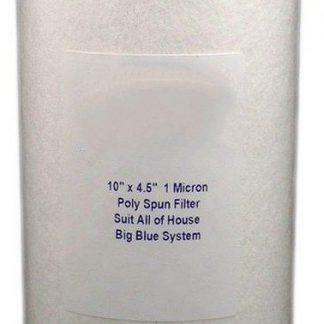 BB Pleated Sediment Filter 1micron 20" x 4.5" BB Pleated Sediment Filter - 50 micron 20" x 4.5"